If you enjoy trying food you've never had before, you'll love 2019. Are you ready for lab-made meat, cooking oils containing hemp, desserts made with hummus,or beverages made with oat milk? There's a lot more that's novel to Americans (cheese tea, anyone, or taffy-like ice cream?) including items and food trends that have been around for awhile but are expected to attract even more fans this year. (Bacon will appear in almost everything.) Read on for more news about what may be on your dinner plates at home or in your favorite restaurants. It seems that everyone in the food industry--from supermarkets to restaurants to every other food-related business--has published an article on 2019 predictions, so check out some of the links at the end of this article to learn more. The food scientists who serve on the Shelf Life Advice Advisory Board see great promise for many uses of hemp, lab-grown meat, and stevia, so let's start with these. Hemp has been around for more than 10,000 years, Wikipedia tells us. In fact, it's one of the oldest plants humans have grown and used. Earliest uses included clothing, ropes, paper, and medicine. Today, it's also used to make plastics, paint, and bricks, among many other products. Here's what The Global Food Forums website says: "Hemp hearts, seeds, and oils are nothing new--they're in everything from waffle mix to dried pastas." But there's new interest among many food companies in the potential benefits stemming from other parts of hemp plants. 1. Dehulled hemp seeds (as an ingredient similar to sesame seeds, sunflower seeds, poppy seeds): It can be used at levels from 1- 40% of total product weight. 2. Hemp seed protein powder (as a source of protein): It can be used at levels from 1- 100% of total product weight. 3. Hemp seed oil (as a replacement for other food oils, e.g. canola): It can be used at levels from 1 - 15% of total product weight. "The GRAS notification for hemp seed-derived products DOES NOT apply if they contain THC (the psychoactive component) or CBD (the component that many consider to have medical benefits) above approved levels. The FDA defines hemp as cannabis plants that contain less than 0.3% THC. Currently, THC is listed as the active ingredient in a drug (pharmaceutical) petition. CBD can come from any cannabis plant, whether defined as hemp or not. The FDA has stated that the source of CBD is not as important as the fact that it cannot be used in foods or supplements because it is also the subject of a drug (pharmaceutical) petition. So THC and CBD products may be allowed in certain states, but they cannot be introduced into interstate commerce." Just in time for this article, the Chicago Tribune gave front-page attention to cannabidiol (CBD), which has been touted as a substance that can relieve migraines, sleeplessness, and seizures, along with minimizing many other problems. The article also pointed out that, part of the "exploding industry of products infused with cannabidiol," is the side business of many women selling dropper bottles of CBD in order to pick up a few extra bucks. One of these women uses CBD oil to treat her anxiety and her dog's arthritis! She has also developed this product she loves into a business; she recruits other salespeople. But here are some caveats: beware of drug interactions when considering using this product, especially if you take blood thinners or seizure medications. Food process engineer Dr. Timothy Bowser (another Board member of this site) emailed us the following: "In my opinion, hemp is an emerging food trend (ingredient). We are seeing it increasingly because it has some desirable properties such as nutrition: Each kg of hemp seed contains about 5,500 calories, 315 grams of protein, 487 grams of fat, 87 grams of carbohydrates, and 40 grams of fiber, according to the USDA," much higher numbers than wheat. It's an especially good source of fiber, said food scientist Dr. Regenstein, also a Shelf Life Advice Board member. Two U.S. senators from Oregon recently wrote to the FDA commissioner about CBD, which they said was "one of the primary non-psychoactive compounds in Cannabis sativa L." They asked for regulations affecting cannabinoids to be updated to give U.S. producers "more flexibility in the production, consumption, and sale of hemp products." Where can you expect to find hemp in foods you consume? In protein drinks, smoothies, energy drinks, soups, dips, spreads, sauces salad dressings, plant-based alternatives to dairy and meat products, cereals, condiments, baked goods, nutrition bars, and beverages such as beer and wine, among other foods. Dr. Regenstein commented especially on the use of hemp in the beverage world. If any products contain hemp, it must be listed in the ingredients list. Dr. Regenstein emailed the following: "I'm watching the attempt to make veggie burgers taste like and behave like meat--and the attempt to make test tube meat." Here's what the editor in chief of Food Technology magazine (published by the Institute of Food Technologists) had to say: "The ultimate entry in the meat arena may well be the commercialization of cultured or lab-grown meat, which, some say, may hit the markets in a year or two. Others expect we'll have to wait a few more years to find it widespread in our nation's supermarkets. Other changes affecting meat or "meat" that editor Bob Swientek predicts:1) better quality plant-based meats and 2) traditional meats that might be improved by genome editing that gives us meat with more protein and healthier fats. land and water would be available for better uses than confining animals to a crowded. unhappy life and then mutilating them for human enjoyment. But Dr. Allen predicts these limitations to lab-grown meats: we'll be unlikely to find lab-grown roasts, fish, or seafood. Lab-made meats have been referred to as "cultured," "lab-grown," and "clean." What they'll ultimately be labeled on packaging is yet to be determined. Shelf Life Advice Board member Dr. Clair Hicks predicts that stevia will continue to grow in popularity among consumers and companies that produce food. Probably, consumers choose it because they're convinced that natural means safer. Also, says Hicks, "Manufacturers have been able to clean up the flavor, which has made it a more desirable non-nutritive sweetener." My own experience with this product is just as a small packet to add to my coffee or tea. I tried it a few years ago and didn't like the taste as much as I liked Equal. (I stopped using Splenda because it gave me a socially undesirable problem: flatulence.) 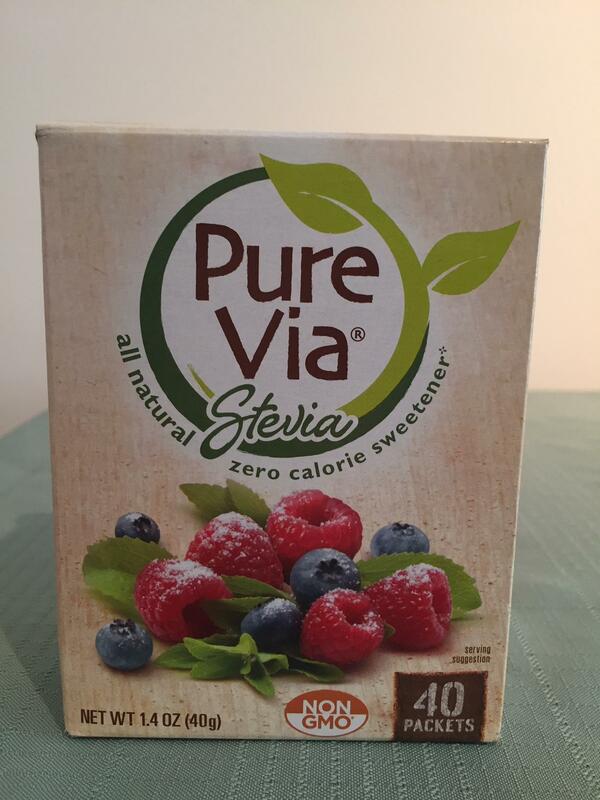 However, the other day I purchased Pure Via, which is made from a sweet extract of the stevia plant to give it a try again. I classified it as okay, but, to me, not as tasty as Equal. And I'm not afraid that Equal will harm me. In January, 2018, Medical News Today posted an article entitled "What is stevia?" The answer is that it's a "bushy shrub that is part of the sunflower family." Here's a surprising fact about it: it's 200-300 times sweeter than table sugar! Furthermore, it can claim to have zero calories because the number of calories is much less than sugar. Since 1995, there has been a 58% boost in new products containing stevia. Worldwide, stevia is used in more than 5,000 food and beverage products. BUT the article says, some stevia products also contain sugar alcohol, which may cause some consumers "to experience bloating, abdominal cramps, nausea, and diarrhea." However. erythritol poses less risk of these symptoms than other sugar alcohols. "Consumers love bacon," says food scientist Dr. Catherine Cutter. Long ago, bacon appeared mostly beside eggs or in BLT sandwiches. And we've all munched on bacon-wrapped dates a cocktail parties. Beyond the expected bacon appearances, several years ago, I was served a bacon chocolate ice cream sundae in a fast food restaurant. Now, bacon's uses have multiplied to an amazing extent. Dr. Allen says there is now bacon lip gloss! Dr. Cutter modified a recipe for slow-cooker bacon jam that was featured online by Martha Stewart and, Cutter's guests loved it, so she sometimes gives a jar of it as a gift. Bacon relish makes an excellent topping for burgers, eggs, or crackers with cheese. Cheese tea: It's "made the leap" from Asia to the U.S. It's iced tea with "a salty-sweet cheese foam topping." Arabic ice cream: It also goes by these names: booza/dondurma. It's ice cream with an "almost taffy-like texture." Why? The texture protects it from melting in the hot sun and makes it much richer than gelato. Oat milk: This is really catching on. It's dairy-free, nut-free, and sometimes even gluten-free (depending upon where the oats were processed). Why are customers attracted to it? The taste: it's creamier than most other dairy alternatives, and it's healthier, with more protein than nut milks, soy milk or cow's milk and more fiber, too. Customers looking to consume more protein will gladly pour some into their coffee. Protein Bar (which has 20 facilities in Chicago) uses it in a drink that combines oat milk with dates, cocoa, bananas, and vanilla whey protein to produce a beverage called the Big Date. Healthier desserts: There are some with hummus, created by The Hummus & Pita Co. They include dessert hummus, which is sweetened with chocolate or cookie dough. Another healthier dessert is the sandwich cookie, served at a Peruvian restaurant named Tanta; this item is chocolate mousse sprinkled with toasted quinoa. Marine munchies: These include seaweed butter, kelp noodles, puffed snacks made from water lily seeds, algae ingredients, salmon skins, and kelp jerkies. Frozen desserts with a healthy touch: Ice cream or soft-serve treats with "innovative bases like avocado, hummus, tahini and coconut water." Grazing replacing a mealtime: Cheese-boards are the ultimate example of this. Portable snack packages featuring cheese or peanut butter and cracker sandwiches also work well. Global Food Forums "2019 Food Trends and Forecasts"
Nation's Restaurant News "6 food trend predictions for 2019"
IFT "10 Food Trend Predictions for 2019." Whole Foods Market "Our Top 10 Food Trends for 2019"
Medical News Today "What is stevia?"